In case you're wondering, that is Happy St David's Day in Welsh. You pronounce it 'hap-pis dee-th Do-wee Sant'. Now we're all that little bit more fluent in Welsh, so it's a pity that I'm not in one of the big towns or cities today. I have no-one but myself to blame. I was up and out of bed early enough to have embarked on a day-trip before any of the festivities began. But I had another cup of tea and messed around on the internet instead. In particular, Cardiff and Wrexham are really fun places to visit on St David's Day. Their city centres become huge parties, with parades, stalls and entertainment. I've not been to Wrexham on March 1st, though I've heard that it's good. I have been to Cardiff on St David's Day, and I left vowing to do it again next year and every year. But Cardiff is a couple of hours drive from my home, and early March still hasn't seen me lifted from my winter hibernation. Hence I've missed both years since through sheer laziness first thing in the morning. If you are close, I do recommend going. The grand parade is worth seeing on its own, it goes on for miles and you get to join the end to maintain that wonderful atmosphere. Then everyone crowds into the main streets, singing with lyrics posted on huge screens, and dancing to whichever band has been hired for public performance. Everywhere you turn there are Welsh cakes on sale, or hot bara brith, the former sizzling on the griddle and coming at you coated in melted butter. The aroma will take you there, even if your tastebuds haven't yet begun to set you drooling. There's so much kindness in the city (as I learned when I received bad news via text mid-party). Celtic hospitality playing out on all sides, and everyone is your friend for the day. So run it past me again why I'm still here and not a hundred miles or so south in the Welsh capital on St David's Day? Yes, error in waking, and the old lesson again that I make bad decisions first thing in the morning. I should stick with what I muse upon the night before. I'm a little late with this one, as St David's Day was March 1st. It's generally a fun day to be in Wales, where the religion is largely played down in favour of being a celebration of all things Welsh. This year, I had great plans of going to Wrexham. I'd heard that there were events going on throughout the city. In addition I have a friend who lives nearby. We could have caught up for the first time since New Year. Unfortunately, the day dawned in a dreary fashion. I checked the weather reports and they promised rain, rain and more rain. Being British, that isn't usually too much of a problem. We're used to it. But the programme of events didn't look as great as advertised either. There was going to be a parade, but the route was just half an hour long and ended with the national anthem. That was it. It was hardly the huge public party that I'd been led to believe. Coupled with the rain, it just didn't seem worth the journey there to participate. It was all a far cry from last year, when I rose early to go south instead. St David's Day in Cardiff should not be missed. I strongly considered going there instead. But ultimately the miserable looking day won out. I huddled inside instead and wrote my 401th article for Wizzley. That was worth it. I got an Editor's Choice Award for my efforts! 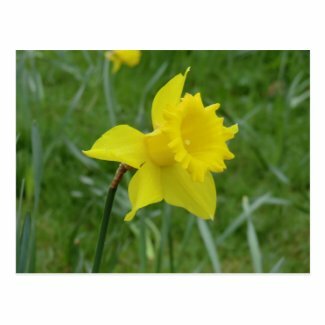 Nevertheless, I would like to wish you all a (belated) Hapus Dydd Dewi Sant, or Happy St David's Day in Welsh. Disclosure: This page generates income for the author based on affiliate relationships with our partners, including Zazzle and others.